Commom public assume ISKCON as a Hindu organisation that propagates the worship of Śrī Křşņa. But on a stark contrast, it is an anti-Hindu/anti-national organisation that tends to divide Hindus by creating rift between Śaivas/Śāktas and Vaişņavas. Past month right before Ambuvācī I posted an article to address a number of falsehoods spoken against Śaivas/Śāktas. 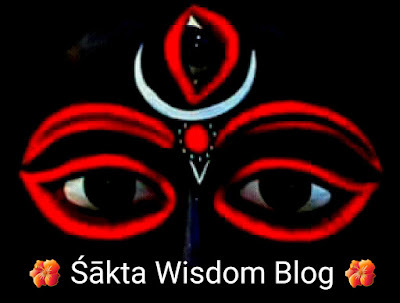 From the comments that were posted by these followers of ISKCON it became clear that an attempt is being made to downgrade Śaiva/Śākta Dharma for praising Vaişņavism; as a result a number of conflicts occured between Śaivas/Śāktas and Vaişņavas, which is a serious matter in the times when anti-national elements are targetting Hinduism to break the unity and integrity of the nation. I don’t think that I need to tell that how general Hindus hate ISKCON for their proselytising ways borrowed from Christianity; why not, after all its founder was an alumini of Scotish Church College and might have incorporated Abrahamic influences into his brand of Gaudiya Vaishnavism. ISKCON is affilated to Gauďīya Vaişņavism, which is attributed to have been started by Śrī Caitanya Mahāprabhu himself. He took initiation as Daśanāmī monk and was an Ekadaņđī Svāmī; this makes him an Advaita Vedāntin, who actually propagated the idea of attainment of Nirvāņa through Harināma Sańkīrtana. But the some miscreants perverted the truth by turning Śrī Caitanya Mahāprabhu into a Tridaņđī Svāmī by circulating false stories regarding him in a so-called “biography” called ‘Caitanya Caraņāmřta’. Out of hatred towards Vedas and Vedāńtins, they have committed Gurudroha by disregarding the actual philosophy of Śrī Caitanya Mahāprabhu and by adopting the doctrine of Dvaitavādins. It is well known that the rites of Dīkşā, Upanayana and Gāyatrī are so rare that many of our fellow Indians are deprived of it; not everyone is entitled of becoming a Dvija (twice-born). But what we see that the founder of ISKCON initiated Mlećhas as his disciples without showing regard to Sanātana Dharma; in other words, Prabhupada sold Vedas to foreigners like hot cake. So 32 disciples, and only 5 original Hindus. Wow. It is no secret that ISKCON is in logerheads with the institute of Śańkarācārya, and have made false claims of having “refuted” Advaita Vedāńta. For this, they have not only committed Gurudroha, but also made false allegation against Advaita to be “Māyāvāda” and condemned it as “hidden Buddhism” by quoting an interpolated verse from Padma Purāņa. The word “Māyāvāda” means ‘doctrine of illusion’, and is used perojatively by Dvaita philosophers for Advaita Vedāńta. Why? Because Advaita considers Brahman as real and the phenomenal world as illusion. Even for the sake of argument if we consider the Padma Purāņa verse to be authentic, then the question arises that what kind of “Māyāvāda” is Advaita- Māyāvāda with Brahman or Māyāvāda without Brahman? ISKCONites cannot deny the fact that Advaita Vedāńta propagated by likes of Śrī Gauďapadācārya, Śrī Govindabhāgavadpada, Śrī Ādi Śańkarācārya, Śrī Madhusūdana Sarasvatī, Śrīdhara Svāmī, Śrī Keśava Bhāratī and Śrī Caitanya Mahāprabhu is an Āstika Darśana since it believes in Vedas and existence of Brahman. So if Advaita is “Māyāvāda”, it has to be “Māyāvāda with Brahman”. The Prasthānatrayī- Bhāgavad Gītā, Brahmasūtra and Upaņişats agree upon the fact that Brahman becomes the phenomenal world by resorting to Māyā, who is also known variously as Vimarśa, Śakti and Prakřti. Brahman and Brahmaśakti are one and indistinct like fire and heat; so ISKCON BY differentiate between the two and disbelieve in either of the two are indirectly opposing Vedas. Everyone are aware of the fact that the English initially came to India as traders & eventually became invaders who conquered, looted and ruled us for 200 years. Now they have come to India again, but this time as “Vaişņavas”. From the list of Prabhupada’s direct disciples it is clear that the institution founded by him had Mlećhas as Ācāryas and an entire lineage has been descended from those who were never entitled to get Dvijahood (except the 5 Hindu disciples). This is nothing but a trick of an American organisation to divide & rule Hindus and create conflict in India. The skeletal figure wearing European cloak is known as Grim Reaper or simply Angel of Death, and is described in the Biblic theology. According to ISKCONites, the figure in the above image represents “death” and “demigods”. Concept borrowed from Christianity. So one can also say that ISKCON is a secret Christian/American organisation that aims to enslave India by dividing Hindus. Alright, don’t believe me; ask the Hon’ble Śańkarācārya of Govardhan Math (Puri) himself. Why does ISKCON calls Shankaracharya a Mayavadi? Hon’ble Prime Minister Sri Narendra Modi paying visit to the presiding Śańkarācārya of Govardhana Mațha (Pūrvāmnāya) Śrī Śrī Niścalānanda Sarasvatī Mahārāja. Hon’ble Prime Minister Sri Narendra Modi paying visit to Belur Math, the Headquarters of Sri Sri Ramakrishna Mission. Hon’ble Prime Minister Sri Narendra Modi making pilgrimage to Kamakhya Temple (Guwahati), the most important Śaktipīțha. Hon’ble Prime Minister Sri Narendra Modi making pilgrimage to Dakshineswar Kali Temple (Kolkata), the Sādhanakşetra of Śrī Rāmakřşņa Paramahamsa (Svāmī Rāmakřşņa Pūrī Mahārāja). Hon’ble Prime Minister Sri Narendra Modi making pilgrimage to Dhakeswari National Temple (Dhaka), the most important Hindu Temple in Bangladesh dedicated to Bhagavatī Durgā. It is no secret that ISKCON considers Śańkarācārya Mațhas & Ramakrishna Mission as their sworn enemies, and also that they hate Ādyāśakti with venomous intensity. So what is the currenr Prime Minister of India, who apparently happens appreciate ISKCON doing with the “enemies” of Vaişņavas and the temples of the “demi-goddess” worshiped by “Māyāvādis”? The simple answer is, Narendra Modi is a politician who needs to consider the interests of Indians of all shapes and sizes; that means he needs vote of both Advaitins as well as ISKCONites and hence he adopts a diplomatic way to deal with both. Sanātana Dharma and its matters are not subject to the political/diplomatic moves of a politician; be he/she a MLA, be he/she the Prime Minister. Hinduism is beyond the approval of a politician in the Indian democracy; it are the Śańkarācāryas of the four cardinal Mațhas who have the right to decide what is right & wrong for true Hindus and Hinduism.